A new cultural center was inaugurated in the town of Kiryat Arba, next to Hebron on Monday night. As predicted, several high-profile actors have refused to perform at the center. The center was built with public funds from three Israeli government ministries, and of course with moneys from private donators. Altogether, there were more than 500 artists signed a petition in recent days calling for a boycott of the center. Earlier in the month, actor Rami Baruch said he would not perform in his play “Pollard” at the center’s opening. Knesset speaker Reuven Rivlin said at the opening ceremony for the cultural center, referring to the Palestinians’ planned statehood bid this week at the United Nations. 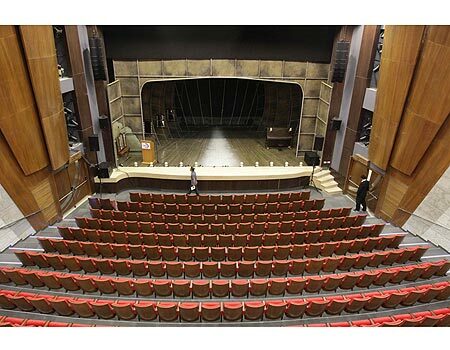 Theater professionals signed a petition a year ago stating that they would not be performing in a new cultural center in the West Bank city of Ariel which was built with more than $10 million in public funds. We’re back to the Middle Ages, to the darkness of boycotts and ostracism on behalf of those who know better than us what’s proper and what isn’t. Their source of authority is their talent, fame, and the limelight. After all, they crowned themselves as “men of letters” and as such they have plenty to say. You better listen to them, or else you would be banished from the space of sanity and from all the goodness offered by this State’s theater district. They already published a first letter, and now they are issuing another warning. What we have is a theatrical reality here: Artists who boycott those who disagree with them on the political front, and on the other hand a rightist camp that boycotts the artists. All we need now is enthused youngsters on both sides to throw the other side’s texts into the bonfire of enlightenment, and there you have the epitome of progress. According to a survey taken last month by Ben Gurion University pollsters, 60 percent of Israelis say they would be in favor of seeing NATO troops deployed in both the West Bank and Gaza. According to the “Israeli Positions on the European Union” survey, 64 percent of Israeli Jews and 63 percent of Israeli Arabs citizens are in favor of seeing peacekeeping forces, (aside from the United Nations) in the West Bank and Gaza Strip. Back in 2009, 54 percent of Israeli Jews and Arabs supported the idea. 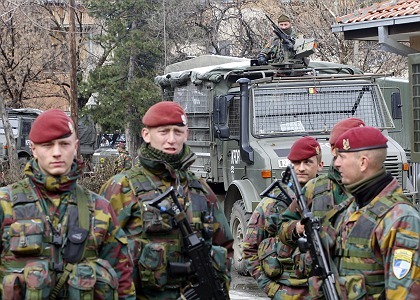 In the poll that was compiled by Sharon Pardo of the Department of Politics and Government, 68 percent of Israelis are in favor of joining the North Atlantic Treaty Organization (NATO). Roughly 81 percent of Israelis want the Jewish Country to join the European Union (EU). These figures are up from 69 percent in 2009, and 43 percent would like to see Israel have better relations with the EU, this is in comparison with 20 percent who would like to see the Jewish Country get along better with the United Nations and just seven percent with NATO. Iran to build nuclear war head? On Monday, the head of the United Nations Nuclear Agency announced their plans to publish new information serving as supporting evidence that Iran could be working on a nuclear warhead. The comments by International Atomic Energy Agency Chief Yukiya Amano were the first time he revealed plans to release some of the recent knowledge available to the IAEA that is causing concerns. A Syrias Situation on the Jewish Country’s Border? Syria’s Bashar al-Assad has ordered his military chiefs to launch another operation on the Golan Heights. 1. He has filled the vacant position of deputy chief of staff with Gen. Ali Ayub, commander of the 1st Formation made up of the 1st, 3rd, 5th, 7th and 9th Divisions, deployed until now on the Golan Heights and Mt. Hermon borders with Israel. Its personnel have been left out of Assad’s military campaign against the opposition until now. 2. Those divisions, made up mainly or Sunni conscripts, have begun pulling back from their positions on the Syrian-Israeli border and are heading north. For the first time, therefore, Assad feels he can safely send Sunni troops into battle against protesters and is not afraid to leave his borders undefended against an Israeli attack. 3. The Syrian president holds Erdogan responsible for authorizing the Turkish army and his National Intelligence Organization-MIT to set up a state-of-the-art command center for the Syrian Muslim Brotherhood at Jabal al-Zawiya in the Syrian province of Idlib near the Turkey border. He believes it is working with a parallel command center on the Turkish side which directs the steps of Syrian protest tacticians against the Assad regime. 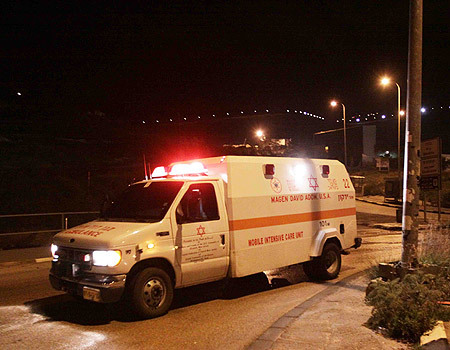 The five members of the Israeli family murdered at Itamar, 1:00 a.m. Shabbat morning were Udi Fogel, 38; Ruth Fogel, 35; Yoav 11; Elad, 3; and Hadas, four-months old. They are survived by Roi, 8; Yishai, 2; and sister Tamar, 12, who discovered her family, butchered, when arriving home late that night. 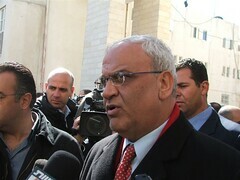 Security officials in the settlement did not know of the incident until three hours after it happened. The family moved to Itamar in the “West Bank,” after Jewish communities were forcibly evicted from the Gaza Strip in 2007; part of the Sharon government’s disengagement. Hamas networks have been regrouping in Judea and Samaria for the purpose of attacking and kidnapping Israelis on either side of the Green Line. 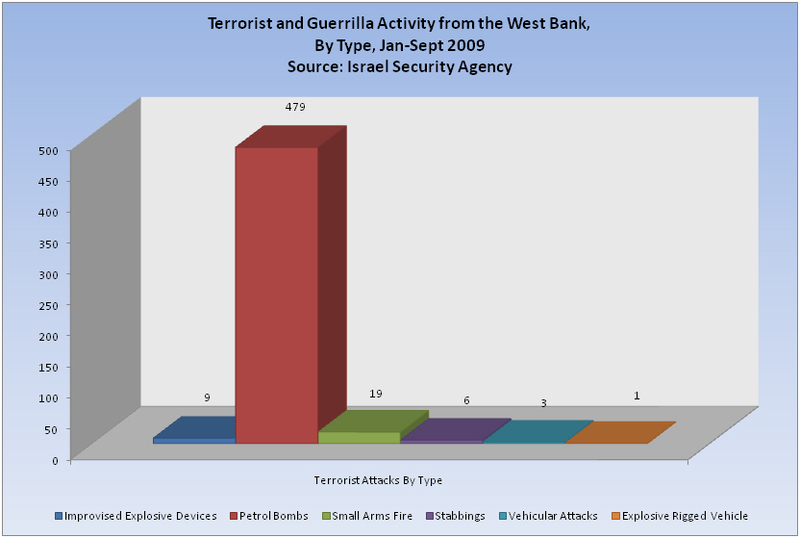 Several Palestinians were detained recently at the few remaining “West Bank” checkposts with pipe bombs, knives and fire bombs. Leading up to last fall’s failed peace talks, U.S. President Barack Obama and Secretary of State Hillary Clinton had pressured Israeli Prime Minister Binyamin Netanyahu and Defense Minister Ehud Barak to grant West Bank Palestinians nearly unrestricted freedom of movement and generous aid for their economic development. Last September, on the eve of peace negotiations in Washington, a loan Palestinian gunman fired at a vehicle traveling on Route 60 near the entrance to Kiryatr Arba. The victims were Yitzhak Ames, 47, and his wife Tali Ames, 45; Kochava Even-Haim, 37, and Avishai Schindler, 24. The ames had six children, including a toddler of one-and-a-half years. Hamas was responsible for that attack. Hamas hailed the murder of the Fogel family, whose throats were slashed, as “a heroic operation.” The attack was the initial result of an Iran-funded secret conference in Khartoum last week of the heads of the national branches of the Muslim Brotherhood. Officials of the Prime Minister’s Office are pondering the option of releasing grotesque photographs of the terror attack aftermath in Itamar to the foreign media. 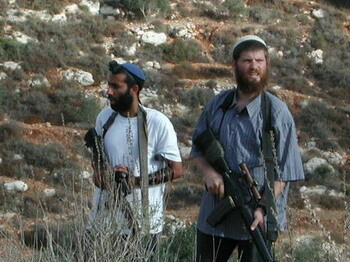 Photographs are not usually published in Israel following terror attacks. Should such protocol be overturned, Israel’s Government Press Office will hand over the photographs to global media outlets. When Binyamin Netanyahu declared the 10-month freeze on building settlements in the West Bank, he was following Barack Obama‘s direction aiming at benefiting the Palestinian cause. However, at the Jalazon Refugee Camp, no one is thanking the Israeli Prime Minister or the American President. They just want their work back. Before the freeze, roughly half of Jalazon’s able-bodied men were employed in construction in nearby Jewish settlements. Along with the freeze, so went the work. The long-term result wished for the freeze was the hurrying along of the peace process; but the short-term is costing thousands of Palestinians in the West Bank their livelihood. Their voice ironically is being drowned out by what they see as a pointless exercise. 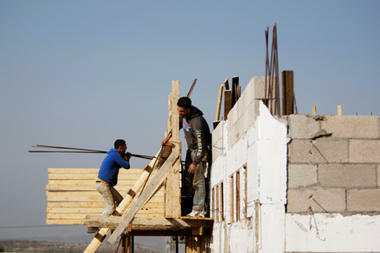 Mustafa estimated that about 80% of camp residents who work in construction are now unemployed, and those still working are taking jobs for NIS 50 a day ($13) rather than the NIS 150 ($40) they made before Israel put a freeze on construction. 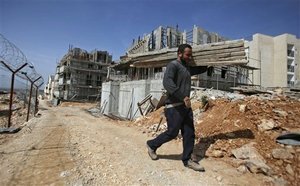 Hardly anybody recognizes the fact that Palestinians who are skilled in masonry, construction, and other relevant trades have built the vast majority of homes in Israel’s controversial settlements. Mahmoud Abbas originally rejected Netanyahu’s offer of a 10-month settlement freeze late last year, maintaining his position that the stop-work order should mean that ALL building comes to a halt, and that it must include east Jerusalem. Bibi exempted approximately 3,000 buildings – projects that had already begun. It has long been controversial for modern Orthodox Jews (or ‘dati leumi’) to serve in the IDF, because it sometimes means that they have to do things that they are not only politically opposed to, but religiously as well. We really saw this in 2005 at Gush Katif and the dismantling of other settlements in the Gaza Strip. Well it still happens. On Tuesday last week, the IDF decided to punish six soldiers, sending two to prison, for protesting the army’s demolition of structures at an unauthorized settler outpost in the West Bank. The soldiers had hung a banner at an army base in the West Bank in demonstration. 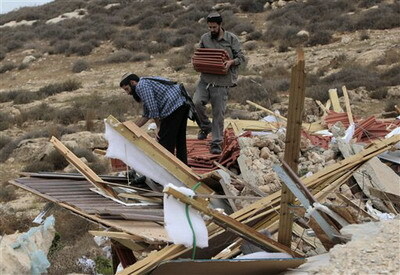 This all went down as other soldiers carried out orders to dismantle two Jewish homes in Negohot, near Hebron. Several Israeli political parties spoke out in support of the soldiers, as did several right-wing rabbis and some have even offered money to the families of troops imprisoned for insubordination. There have also been cases of troops with left-wing views refusing orders or refusing to serve entirely because they disagree with Israel’s treatment of the Palestinians. One possible solution is this: Israel might cease to use the IDF for operations against Israeli citizens. And instead police should handle settler issues, while the army patrols the borders. Meanwhile Hamas is offering a bounty of $1.4 million to anybody who captures an Israeli soldier, adding further fear and tension to conflict. Dr. Mordechai Kedar of Bar-Ilan University discusses Jerusalem and the settlements on Al Jazeera. In an effort to discourage Palestinians from selling land to “the enemy” a Palestinian Islamic court authorized the death penalty to a man from a small village of Bet Umar north of Hebron in the West Bank. The man, Anwar Brigith, had been convicted of selling land to Jewish settlers living in the area, and was found to be in violation of a Fatwa issued by an Islamic judicial panel forbidding the sale of Palestinian land or houses to Jews. Brigith was also found to be in violation of a 1979 Palestinian military law (authorized during Yasser Arafat‘s tenure as head of the PLO) which also stated that it is forbidden to sell Palestinian land to Jews. All of Brigith’s personal property, including that belonging to members of his family, may be confiscated as well, due to this harsh conviction. Why this incident notes merit here, is that we might have expected this kind of punishment to have been levied by a judicial body located in a country like Saudi Arabia or even in Hamas controlled Gaza; where Jews once had property until the disengagement is Israel from Gaza in August, 2005. That this ruling was issued in the West Bank city of Ramallah, where the Fattah controlled Palestinian Authority headquarters is located, doesn’t bode well for any future agreements between Israel and the Palestinians. Most Palestinians appear to support this kind of sentence against “traitors to the Palestinian Nation”; and although no such sentence has been formally carried out (at least on the West Bank anyway) several Palestinians have been kidnapped and murdered for what were considered to be crimes against the “honor and sovereignty of the Palestinian People”. This has included deals involving property in the Old City of Jerusalem sold to Jews. Many properties, as well as tracts of land within what is now Israel proper, i.e. within the pre-1967 boundaries, were purchased originally by Jews from Arabs; and it remains to be seen how these parcels will be treated in any final settlement. Many land deals have been made recently in areas like the Galilee – areas, which could one day be “swapped” for permanent settlements now located on the West Bank, if politicians like Avigdor Lieberman have their way. 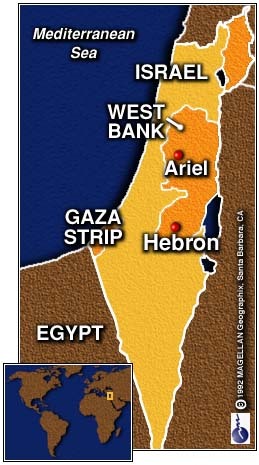 Ariel is one of the largest settlements in the West Bank; a central point of contention between the Israelis and the Palestinians in a future Peace Agreement. There is an academic center that operates in the city since 1982, titled “The College of Judea and Samaria in Ariel”. It began as an affiliate of Bar-Ilan University, but later went its own separate way. In the last three years, several parties have been attempting to grant the college of Ariel a University status. Recently, the college even changed its official title to “Ariel University Center of Samaria“. However, this move wasn’t authorized by the Ministry of Education nor by the Council for Higher Education. Today it was announced that these two bodies officially revoked the academic center’s University status by refusing to review any correspondence sent to them which carries the unapproved title. The practical meaning of this is that students who graduate from Ariel won’t be recognized as degree holders elsewhere in the country. Currently, there are only 6 institutions in Israel which carry University status, while all the rest are being regarded as Colleges. The title has significance when it comes to the flow of funds from the governments and from private donors, as well as having impact on the prestige of the graduates’ degrees and the graduates’ prospect of finding good jobs. Now, the Ariel affair is more of a political battle than simply a matter of bureaucracy. First, bestowing a certain college with a University status is a unique and rare occasion in Israel, and it happens once in many years. Therefore, granting “the College of Judea and Samaria in Ariel” a University status would mean that the prospects of the government establishing a new university in the Galilee (a northern part of Israel) will greatly diminish. And such a northern university has long been in demand. Moreover, giving Ariel what it wants would send a clear political message that Israel considers Ariel to be an integral part of the country, damaging both the peace talks and Israel’s diplomatic position in the world. In response the aforementioned announcement, students in Ariel told the media that “this is a declaration of war made by the Ministry of Education”.